Happy spring everyone…my name is Bubbly and I’m a five-year-old boy. I came from the streets of Cairo and somehow magically arrived in your amazing country. I was pretty skittish, skinny, and smelly when I first arrived but not any more. I have put on weight, smell sweet, and am much less fearful. I am getting more comfortable every day and my fabulous foster family is showing me the ropes and I’m starting to get the hang of your Canadian ways. I still have a way to go but I’m learning ‘sit’, ‘stay’, ‘come’ and I’m even getting the hang of the leash thing if I have a halti. I need more socialization with other dogs although I do get along with my cousins I’m currently staying with, so if you have another dog who is gentle and calm, I think we’ll be good together. You just have to be patient with me and also assure me you are the alpha so I can feel safe knowing you’re the leader of my pack. I love people. I currently live with cats but I don’t like them. I love kids but I am very enthusiastic so if kids are too young, I could knock them over with my enthusiasm. I am not gentle with my food and treats yet but I’m working on that. I love car rides and recently I’ve learned to play fetch and I love it! I can be left alone if you have to out without me and I used to dislike being touched but now I love those belly rubs. I just need more time and constant assurance that I’m safe and loved. In time, I will become the confident, goofy Golden who’s yearning to come out. I’m healthy except for some ear infections which are getting better by the day. I’m loving, smart, and grateful to everyone at Golden Rescue for saving me. If you can please give me some time and patience to get acclimatized and comfortable in your new world, I will pay you back with love and gratitude every single day. Bubbly is currently being fostered in the Wasaga Beach, ON area. 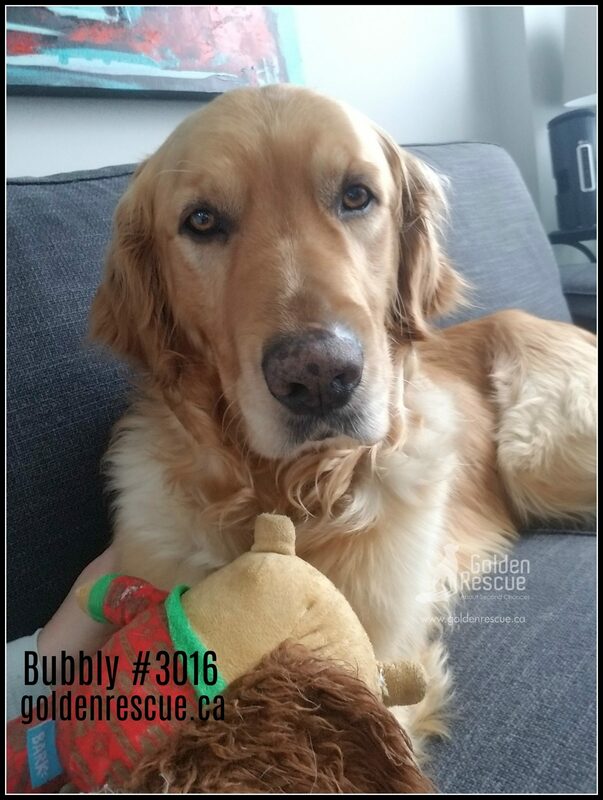 If you would like more information about Bubbly please call our hotline toll free at 1-866-712-8444 or email adoption@goldenrescue.ca and one of our volunteers will be happy to return your call. If you are interested in adopting one of the Goldens posted on our website or any of the other Goldens that become available for adoption in the future please click here to fill out the adoption application.